That morning, clouds hung over the Tugu Pahlawan Surabaya, the hero monument located in Surabaya - Indonesia. However, this did not necessarily dampen the enthusiasm of hundreds of Surabaya people who were cramming in to take a closer look at the Surabaya Vaganza show which was a part of 726th Surabaya City Anniversary commemoration agenda, celebrated each year, on Sunday, 24th March 2019. The parade carried the theme Puspawarni, as a place to unite the diversity of people living in Surabaya. 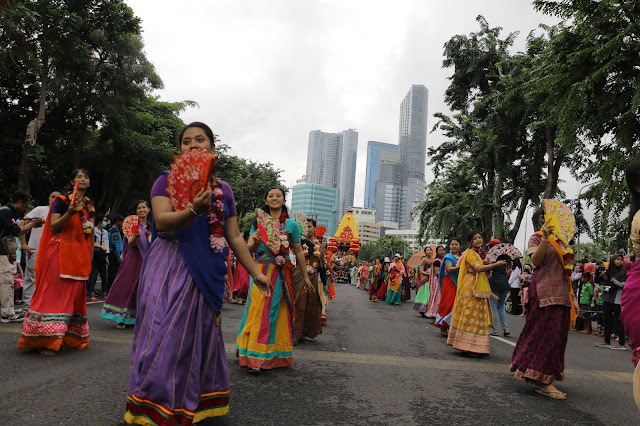 This year’s parade was special because the show got enlivened with 40 decorative cars and boasted of participants from 37 cross-cultural communities. 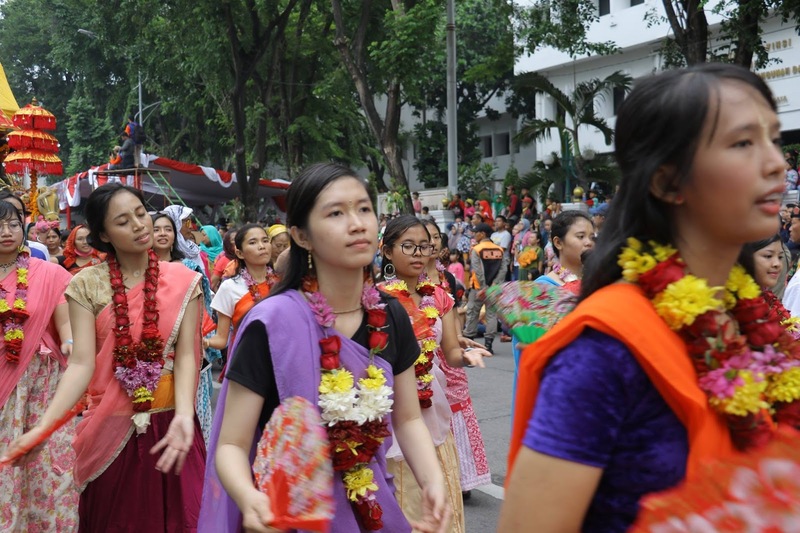 ISKCON community in Surabaya was also given an invitation and as soon as the opportunity arrived, the devotees arranged for the Lord Jagannath’s chariot festival. 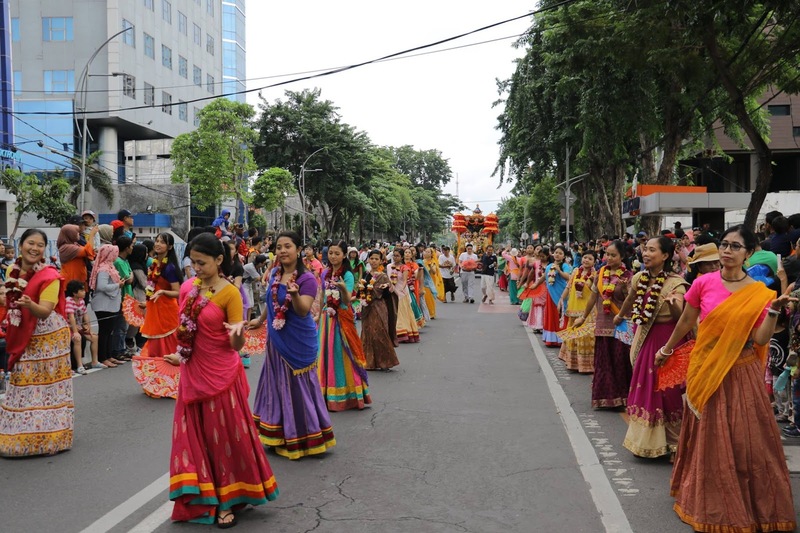 Devotees enjoyed spiritual bliss on pulling Lord Jagannath’s chariot and the people of Surabaya, in turn, received the inconceivable merciful blessings of Lord Jagannath. 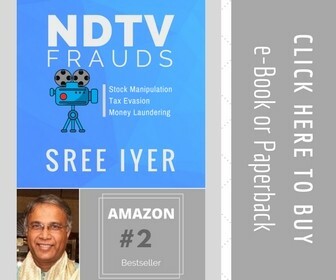 Here is a short report. In the penultimate evening, many guests arrived to attend the Gaura Arati program. Lecture was delivered by H.H. Atmanivedana Swami Maharaj. Maharaj glorified the Rath yatra festival, telling the significance of the Rath yatra. Evening program concluded with sumptuous prasadam. 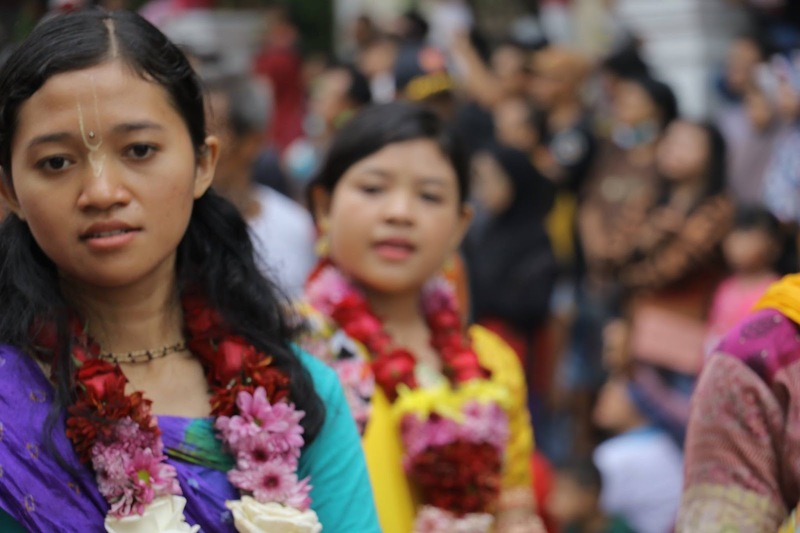 Then devotees returned to their hotel to retire for the night. Early next morning, the devotees started with the auspicious Mangala arati program and then finished their japa rounds. Festival for the devotees began shortly after with the bringing of their Lordships Sri Sri Jagannath, Baladev and Subadra Devi to their throne on the beautiful decorated chariot. The pujari offered bhoga and followed with the offering of the arati to their Lordships. As the chariot got ready to be pulled, coconuts were offered to invoke auspiciousness for the ratha yatra. 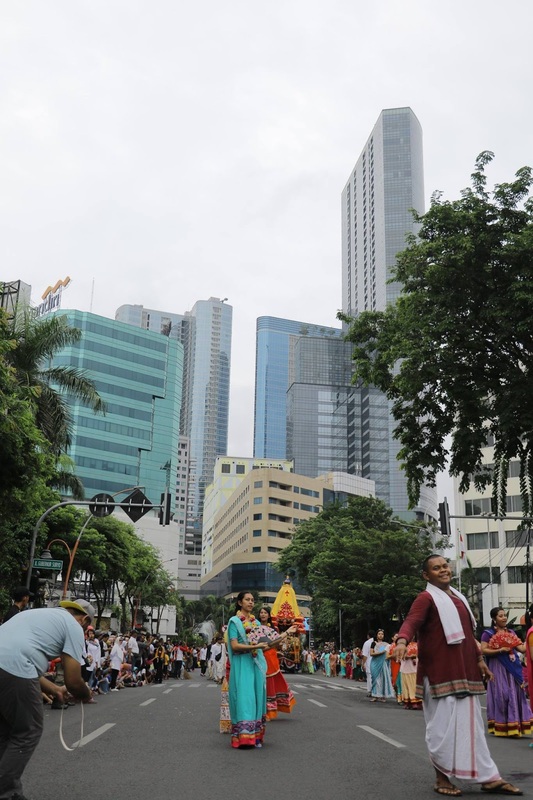 The starting point of the Surabaya festival was at Hero field three kilometers away from the Rath. 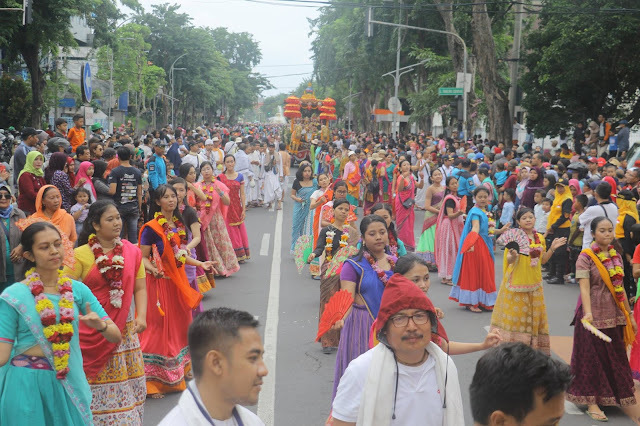 Devotees pulled the chariot to the starting point with full enthusiasm. Numerous other participants were seen preparing for their performances. After sometime the Mayor opened the Surabaya Vaganza with a motivational speech. He encouraged the people of Surabaya to take care of the diversity and pluralism of the city and also pushed the people to become hard working in their lives. The parade opened with the performance of a marching band and then one by one the participants passed through the stage. 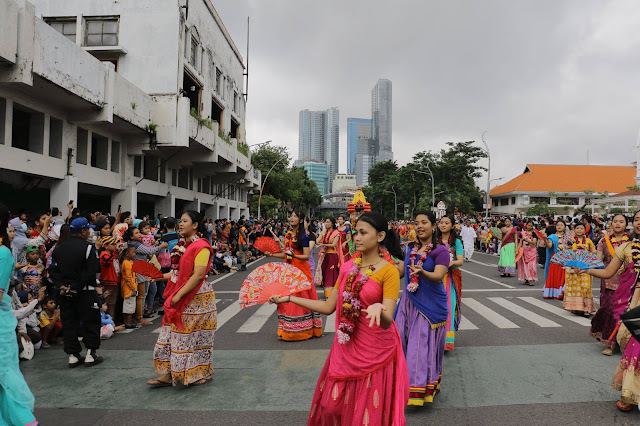 With the turn of the devotees to pull the chariot across, as the spokesperson announced the participation of ISKCON in the festival, the audience responded with a loving hearty applause. 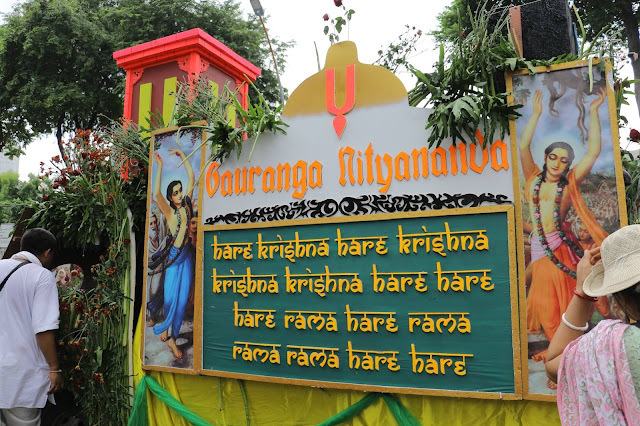 Kirtaniyas suffused the entire atmosphere with the sound of the Hare Krishna mahamantra, inducing the people to join in the singing. All along the way of the carnival, the devotees distributed 1 ton of orange prasadam offered beforehand to the lord. The enthusiasm of the community to get the maha prasadam made the devotees overwhelmed to distribute oranges. Also the book distribution warriors were seen skillfully offering books to the audience. Many among them bought Prabhupada’s book which they will share with their friends and relatives. 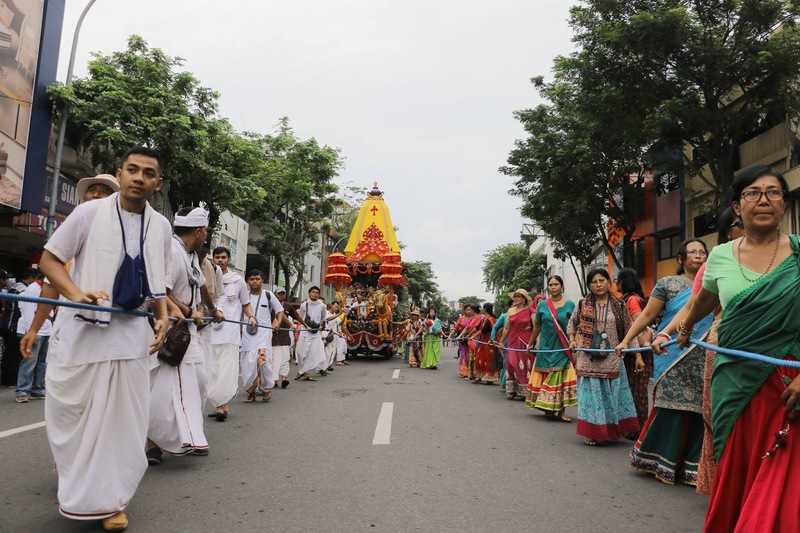 After a long strall of 3 hours the chariot Yatra concluded as it reached the honor stage where Mrs. Risma, the Mayor of Surabaya welcomed the participants. A flower garland offered to the Lordships was given to the Mayor and her guests. 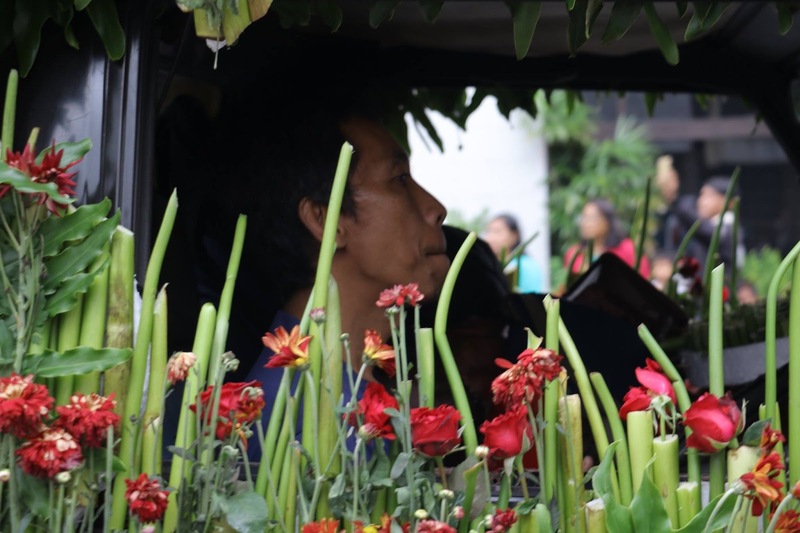 After the concluding ceremony, many people joyfully came forward to have flowers from the chariot irrespective of their cultural background. Krishna Consciousness is so attractive that it attracts the heart of everyone who comes in touch with it. After the wonderful Ratha, the devotees and the Audience felt divine happiness. 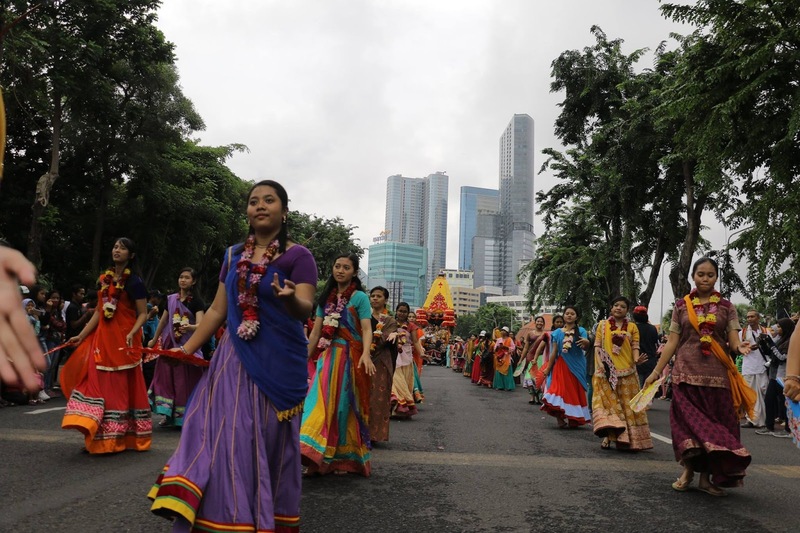 Later, the devotees retuned to the base camp to honor prasadam and prepared to returne to their respective homes.